With all my years as a gamer, I never quite jumped into the micro-genre of teaming-up-to-fight-monsters that seems to excel on portable consoles, like the PSP and 3DS’s Monster Hunter franchise and the PS Vita’s Soul Sacrifice. I dabbled in a little Lost Planet 2 for a while on the PS3, and I’ve kept up with upcoming games like Freedom Wars, but this is an altogether new experience for me. 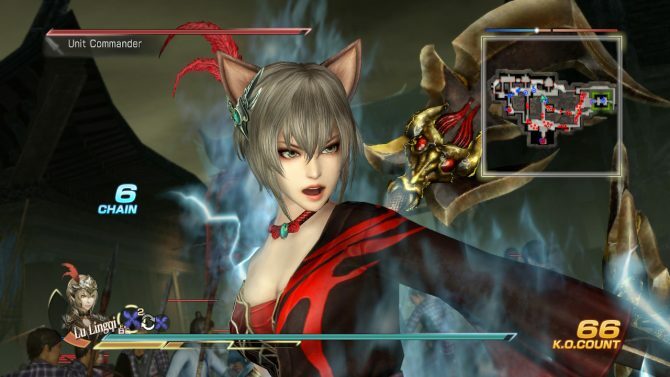 So when I started Tecmo Koei and Omega Force’s Toukiden: The Age of Demons, I went in with a somewhat fresh perspective, someone looking for a new experience. Toukiden gives players a great portable game, one that largely succeeds based on its formulaic structure, even if at times a little repetitive. (Note: all of the screenshots within this review were captured by the author via the PS Vita’s built in screenshot feature). 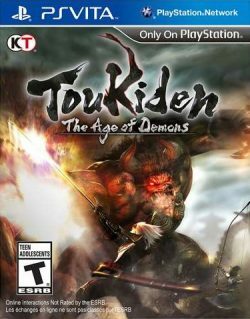 Toukiden: The Age of Demons is set in a world where the catastrophic event called The Awakening brought along eight years of calamity, flooding the world with the monstrous Oni and causing humanity to fall back to various villages protected by warriors known as Slayers. These Slayers are the last line of defense between survival and extinction, fighting with the power to purify Oni corpses and rid them of the aura of vile called Miasma that pollutes the air. 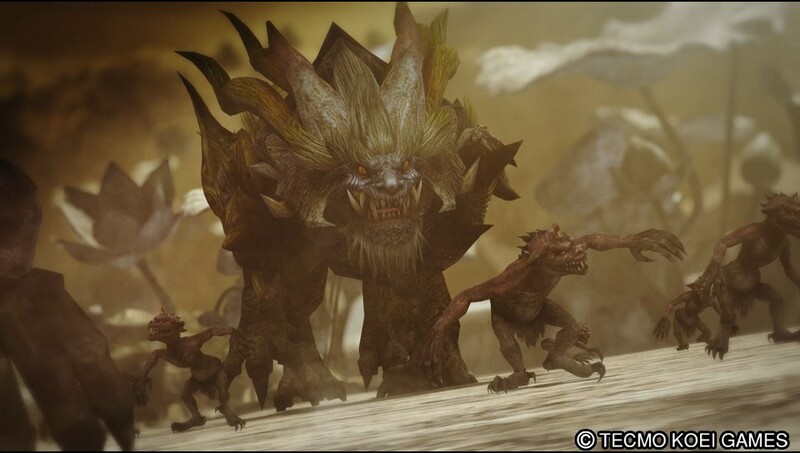 Toukiden sets its priority from the very beginning, putting players into combat against a brutish Oni monster, and giving them the choice of six different weapons (don’t worry, you can change to something else soon after the start of the game, and try out a set of tutorials that introduce how each weapon can be used). Each weapon has its own set of strengths and weaknesses, and to Toukiden‘s credit, each feels incredibly unique from one another. The Sword, for example, isn’t the typical button-mashing broadsword it is in most games. Here it is of a length that would make even Final Fantasy 7‘s Sephiroth envious, and is used with particular combos that offer strong and swift hits. Swordsmen can also perform evasive attack moves and focus their power into their blade for stronger hits for a limited time. The Spear can be used for distance attacks, sweeping multiple foes away or thrusting into single enemies for major damage. Spear users can take a defensive stance for an automatic counter attack, or pole vault into the air for an aerial dive attack. The Knives are useful for quick, successive hits, but also allow for special leap attacks and aerial combos. Short blade-specialists resemble the Ninja of most action games, with a dashing mode that lets them sprint-while-slashing, and a spinning attack that would make Tekken‘s Yoshimitsu proud. The Sickle & Chain offers a lot of variety, allowing players to engage their enemies as mid-ranged specialists by using the chain for distance, and the sickle to cut down enemies who break through their defense. Players can also use the Sickle & Chain as a hookshot, drawing themselves instantly closer to their targets for quick damage. The Gauntlets are for fighting enthusiasts, and require a little more thought behind the hits. Pressing square the moment before an attack hits adds more damage, potentially making for a powerful four hit combo; there’s a burning attack that can heat up the body parts of an enemy, making them more susceptible to damage; there’s a block and counterattack option available for great damage dealing and damage evasion; and there’s a flurry attack that lets the player perform dozens of punches in seconds. Think of this as an RPG Monk class with a well-trained body fighter finding and exploiting flaws in their foe for a swift defeat. Finally there’s the Bow, which allows for regular and charged attacks, and singular and multiple nocked arrow attacks. The Archer can also used a “Cursed Mark” that explodes upon contact, and a homing attack. I found that the Sickle & Chain and Knives were great entry level button-mashing classes (with room for depth); the Spear and Bow are great, safe weapons to keep distance but do worthy damage; and the Sword and Gauntlet were a little more skill-based. But no matter the weapon, each class comes with a Stamina meter that gets used when sprinting, performing special attacks and when doing leap attacks. Players also have “Destroyer” attacks, moves that can instantly kill lesser enemies or tear off a limb in one hit by pressing the icon on the touch screen or by pressing square and triangle at once. While all of these are incredibly important for building a stronger team, there’s an extra layer to combat with Mitama. Mitama are the “souls of heroes trapped by Oni,” warriors whose spirits were eaten by monstrous enemies in the past, freed by the player, and whom lend their support with various special abilities and boosts. Equipping Mitama to your weapons comes with a great variety of powers, with some focusing on attacks, some on recovery, and some on support skills. 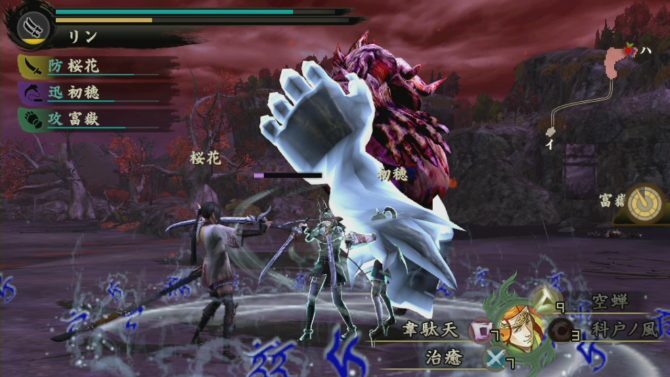 The Mitama Abe no Seimei, for example, gives players special ranged magic: Eruption allows the player to trigger an explosion on the last attacked limb on a target’s body, usually causing a one-hit kill for smaller creatures or a torn body part on larger beasts. The Pursuit ability, however, shoots a projectile homing blast at the enemy, also targeting the last attacked body part. The Mitama Lady Tokiwa, on the other hand, gives players a quartet of healing abilities, including Panacea, which heals all allies on the map of any status ailments, and Vitality, which creates a field of restoration for any allies who stand in it. Taira no Nortisune and Minamoto no Yorimitsu’s Leech allows players to steal health every time they attack their foe; O no Yasumaro’s Barrier nullifies all damage for a limited time; and Takeda Shingen’s Illusion hides any allies who stand within its range. 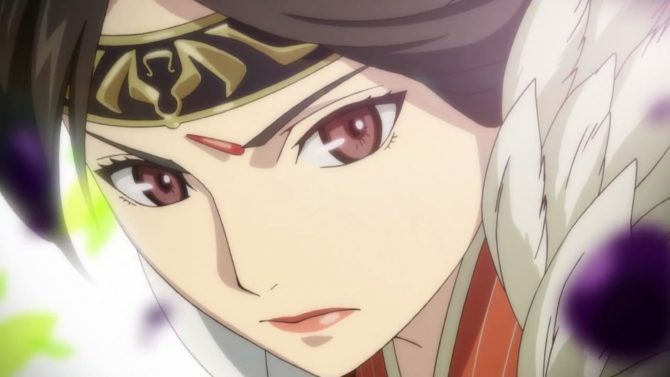 The point is, Toukiden has a generous amount of Mitama to use, which compliments players’ weapon skills and give specialties in speed, deceit, restoration and more. Players can either play to their strengths, using power buffing abilities to make attacks stronger or their movement faster, or cover their bases and maintain a decent defense in the face of the unknown. This also lends itself to more options in building squads to take down specific kinds of monsters, either in playing multiplayer with other players, or in choosing A.I. companions to take with you in single player. But what is a world worth saving if you don’t care about it? All of these details come back to you, the player, who at the start of the game has become the newest recruit of the Slayers. You’ve come at a crucial time, to fight against the Oni and protect Utakata Village, home to a band of other notable warriors. 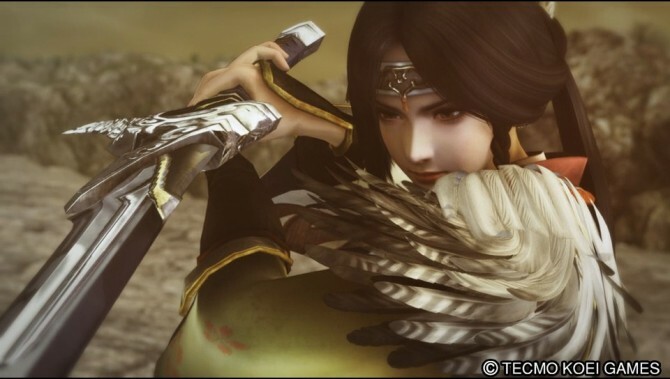 It’s also part of an alliance of villages making a final stand against the Oni, with Toukiden using the player’s arrival as a setting off point for a major change in the war for peace. Unfortunately this plot starts building about halfway through the game, missing some opportunity to start the game with a bigger bang. It’s more of a by-the-numbers gathering of heroes — with your character the special and unique “golden child” of a sorts, able to commune with far more Mitama than a normal Slayer — and then a sudden twist that rises into a decent climax, but nothing never seen before. But still, Toukiden is indeed an interesting world, one set in a fantasy setting but taking much of its influence from historical Japan. This is seen most in “The Otherworld,” a place where Miasma builds up and warps time and space, causing the lands to resemble ancient periods. 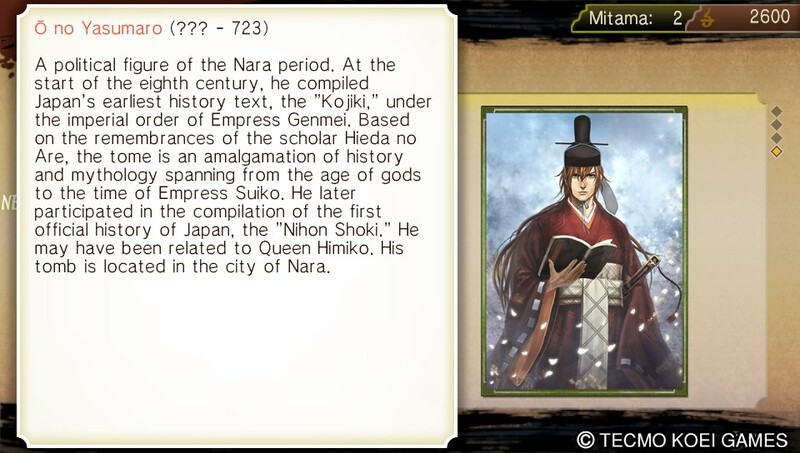 The “Age of Grace,” for example, resembles the Nara and Heian eras, while the “Age of War” resembles the Sengoku era. It is here where players will conduct missions and where they can take on the Oni. At first the stages will seem bland and uninspired — especially in the “Age of Grace” — but later stages, like the “Age of Peace,” show off beautiful designs that may distract you while hunting mercilessly hunting evil. While there’s little variety in the terrain you battle in (since movement is limited without an innate way for players to jump), there’s still plenty to look at in the background, with lakes full of destroyed ships, streams of autumn red leaves that players can wade through, wooden bridges to cross, and florescent trees that are breathtaking at night. In these stages are a fair amount of beasts, with new ones that appear in each new Age. These range from the lowly Imps to the dangerous Poisonspitter spiders, from the lumbering Drumbles to the literally electrifying Blitzers. And while the lesser beasts in the game have a decent degree of difference design-wise, it’s really the boss fights that make Toukiden shine. As mentioned before, Slayers have the innate ability to “Purify” things polluted by miasma. When enemies are defeated, players can purify them to receive special items that can be later sold or used to create new weapons and armor. When facing giant enemies, however, players can use the Four Eyes ability (read: Detective Mode) to see which limbs are getting weaker, concentrate attacks on them, and sever them one by one to impede the enemy’s movement and attack power. After severing limbs, players can then hurry and Purify the limb, preventing the beast from regrowing it while also obtaining a special item. Doing this creates a transparent purple effect that takes the place of the body part destroyed, so that for the game’s purpose the creature can still move along as usual, but mechanically the creature is now deformed. Take for example the Windshredder. Omega Force does a brilliant job animating the Windshredder, to the point that its ferocious behavior and feral agility make it hard for players to attack it for long before it can get away or counterattack. Severing limbs drastically affects its ability to dodge and pounce on the heroes, making it more likely to instead slip and fall on its side long enough for a decent combo chain or special attack. This is where Toukiden is at its best, forcing players to work together at taking down the Oni lethally. Having a Gauntlet user burn the limbs of beasts while someone else attacks it means faster limb damage; having a Knives, Spear or Sickle & Chain user for group or aerial attacks is great for flying enemies or titanic foes with hard to reach limbs; having a Bow user who can attack from afar and hit vital areas is a fantastic aid in battle. Having the right Mitama abilities to keep you going is vital to success as well. But all of this unfortunately follows a completely repetitive formula: fight in a mission, come back to the village, purchase weapons and Mitama upgrades when possible with the Haku currency, save and go to the next mission. Rinse, repeat. Even the monsters are just palette swaps of one another (with slightly different abilities), and many missions involve hunting down a particular type of monster before moving onto the next type. Kill 10 Imps, then kill 10 Blazing Souls; secure Red Zone (which has both Imps and Blazing Souls). Now kill 5 Drumbles, wait for the Boss fight to appear, and…well, you get the idea. 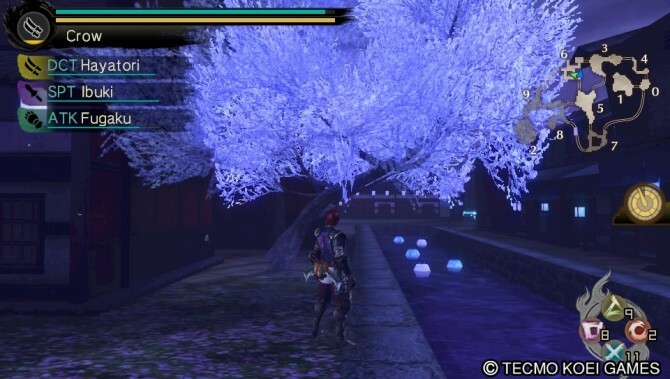 There are many things Toukiden throw in to break this pattern: Quests, which are challenges that require you to fight X amount of enemies or find X amount of items in exchange for Haku; an Offering Box where players can pray for special boosts before battles; a Guardian Tree where players can make offerings for items; and Tenko, which resemble the mythological Kitsune (magical multi-tailed foxes), who can teleport and bring items from specific periods back for the player. As you can see, all of these are related to finding more and more items; the higher the scarcity the better, lending itself towards a mildly addictive and never-ending cycle to get better items for better weapons for better fighting for better items and on and on. Rinse, repeat. There’s also a slowly developing story with the other Slayers at Utakata Village, with the laid back spearsman Ibuki; the ditzy and youthful Sickle & Chain master Hatsuho, who claims she’s older than everyone; the incredibly smart but longwinded archer Nagi; the all-around tough guy brawler Fugaku; the strong-willed field leader Oka; the mysterious ninja Hayatori; the grizzled leader Yamato; the kind Kikka, among others. Players explore the various characters’ backgrounds with mildly interesting minor milestones, but generally there’s never quite enough to make you too involved in the overall plot. There’s dialogue options and side-missions here and there, but none that drastically alter the scope of the narrative. Toukiden knows what it is: a portable, generally multiplayer experience that runs smooth online and has great tactical team mechanics (you can even use copies of players you’ve fought alongside online in your offline single player missions). And while the other options available are solely a means of superficially fluffing the game, it does attempt to at least deliver a serviceable plot with interesting characters, something that could be built ever stronger in future iterations. If you’re looking for a fun, formulaic game where you can take down monsters with friends, then Toukiden is that game, a pleasant addition to the Vita’s list of titles. For a closer look at the game, check out my gallery of Toukiden screenshots below; for more on the game, check out all of DualShockers’ Toukiden news, screenshots and trailers.